Every time I mention that I have a latex pillow on my bed to a friend I get a very strange look. But the Dunlopillo super comfort latex is so comfortable! It’s got a quite a strange bounce to it that makes it totally unique, softer and more responsive than memory foam while being much more supportive than a hollow fibre or a feather pillow. It’s definitely on the pricey side but when you feel it you know it’s going to last, it has a 5-year guarantee but I can see it lasting far longer than that. It just doesn’t feel like it’ll ever go flat! So while a regular pillow should last 1-3 years I reckon you could get a decade out of this pillow and still be completely comfortable. Excellent value. Latex is also a completely natural pillow, it’s made from the sap of a rubber tree which then goes through a chemical-free treatment leaving you with a firm bouncy pillow. Great for side sleepers and back sleepers but might be a little tall for front sleepers. Overall, If you struggle to find a good comfortable pillow then this is definitely the pillow for you. If you want more pillow recommendations then check out this article. 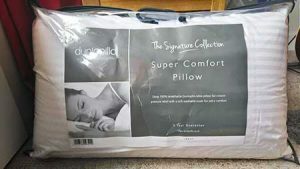 The Dunlopillo Super comfort latex pillow is a luxurious full block Dunlopillo Talalay latex pillow giving comfort and instant pressure relief to your head and neck. This Dunlopillo pillow is firmer than the Serenity deluxe and offers medium/firm support. This Dunlopillo latex pillow is covered in a luxury removable knitted cover, which makes the pillow easy to clean.